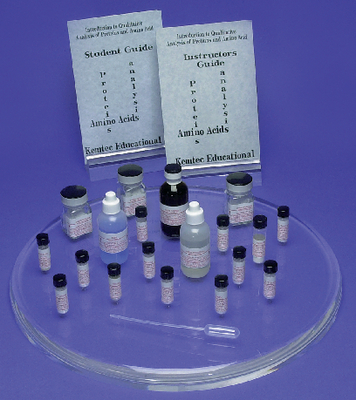 This kit demonstrates the principles of protein and amino acid analysis and enables students to identify unknown compounds. In this set of lab activities, students work with the proteins albumin and gelatin and the amino acids glutamic acid, glycine, cystine, cysteine, tyrosine, tryptophan, and arginine. Ninhydrin detects the presence of amines and indicates the presence of amino acids and/or proteins, the Biuret test detects the presence of peptide bonds, and specific analytical tests determine the presence of individual amino acids. Protein and amino acid analysis techniques are an integral part of biochemistry, and the range of tests available for analyzing amino acids and proteins indicate their importance. Ordering information: This kit includes a pipet, biuret solution, sodium hypochlorite solution, alpha-naphthol solution, sodium hydroxide (three different solutions), ninhydrin, lead acetate, albumin, gelatin, glutamic acid, glycine, cysteine, arginine, DL tyrosine, DL tryptophan, cystine, unknown amino acid, protein-testing solution B, and sodium hydroxide. Concentrated nitric acid, ethanol, hot plates, balances, glassware, and distilled water are required but not included.